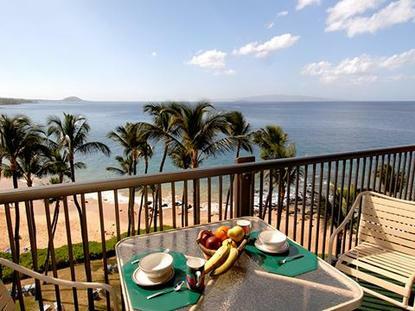 The Mana Kai Maui is conveniently located on a mile long white sand beach in the South Kihei area. Choose from either apartment or hotel accommodations. The apartments include one and two bedroom suites, complete with fully equipped kitchen and private lanais. Hotel type rooms are comfortable bedroom/bathroom, air conditioning unit with mini-fridge, coffee maker only steps from the beach, and sleep up to 2 guests. All units have daily maid service, ceiling fans, cable TV, in-room safes and telephone. Take advantage of the truly resort atmosphere with special features including heated pool, open air dining with lounge, beauty shop, activities center, apparel store and gift shop, general store complete with ATM, and conference and meeting facilities. A cleaning fee will be charged on stays less than 4 days.